Kylie has been involved in hair since she was a young adult, not only at premiere and boutique hair salons, but also within hair events. Most recently Kylie has been involved in Brisbane Fashion Week 2015 and Brisbane Racing Carnival 2015. Kylie was previously a client of Elite and was so impressed with their service. 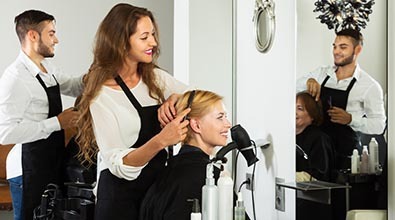 She believes Elite is a fore-runner in the beauty industry, who’s director has a very high-standard in hair quality and service but also a drive for hair innovation and client experience. She has been working with Elite for 6 months. She loves working at Elite as her job requires high attention to detail and compassion. She spends any of her spare time coming up with innovative ideas to help client’s receive the Elite experience every time. Kylie is a total superstar at the basin and gives a winning head massage.